Conor McGregor is apparently in trouble with the law again. Per The Miami Herald, the popular former UFC featherweight and lightweight champion was arrested on Monday night after allegedly smashing a fan’s phone at 5 a.m. in the morning. McGregor is set to be charged with strong-armed robbery and criminal mischief, both felonies, per a Miami Beach police spokesman quoted in the above-referenced story. The incident reportedly took place outside of the Fontainebleau, which is home to the nightclub Liv. “The victim attempted to take a picture of the defendant with his cell phone. The defendant slapped the victim’s phone out of his hand, causing it to fall to the floor. It’s been a rough year for McGregor with law enforcement in the United States. 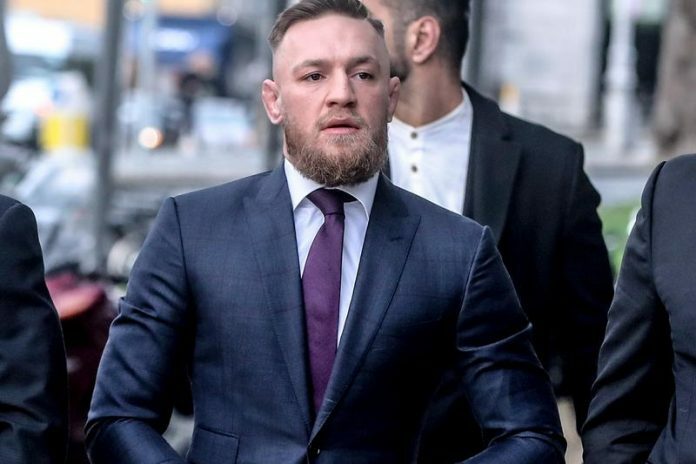 Back in April 2018, prior to UFC 223, McGregor and cohorts were involved in the infamous bus attack that left members of the promotion’s roster injured. A number of civil suits followed as well as a criminal investigation. McGregor ultimately took a plea deal. He pleaded guilty to disorderly conduct as New York state prosecutors agreed to drop the two felony charges. This deal which did not include probation was key for McGregor resuming his MMA career. Had he been charged with a felony or received probation, he would not have been able to cross the border to compete in the United States, as he is a citizen of Ireland. McGregor returned to action in October at UFC 229 where he was defeated by Khabib Nurmagomedov via fourth-round submission. Immediately after the bout, a brawl ensued. McGregor and Nurmagomedov were among those punished for their part in the scuffle by the Nevada State Athletic Commission, but it didn’t worsen his legal predicament in the United States. It’s unclear how McGregor latest scrape with authorities will impact his career–if at all. McGregor is still serving his suspension stemming from the UFC 229 brawl but has been rumored to face Donald “Cowboy” Cerrone in a return bout. It is believed he was in Florida vacationing as he awaits an opportunity to return to the Octagon. McGregor remains the biggest draw in the UFC, and he has yet to compete for the promotion since it began its multi-year broadcasting deal with ESPN.